Here is my latest MT for my collection that may see some use in the future. It is a tempting MT to try out. What I am talking about is the left one on the picture that is the Gerber Center Drive. It’s been around for around a year if I remember correct. Already people have made videos on use and there is talk about it on the internet. It got the philosophy in engineering and mindset that I have talked about for years. Larger tools for larger tasks. Larger tools are more comfortable and safer. The Center Drive got a large bit driver with a good magnet for standard bits. Because it can use standard bits I did not have to buy the bit-set because I have so many bits and also holders that I can use. It got carbide inserts in the cutting section of the pliers that can be rotated. It got a really large knife blade. 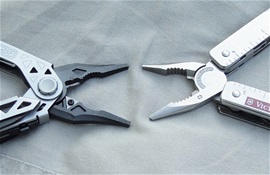 The pliers, knife blade and bit driver can be opened with one hand. Not to forget locking mechanisms that is present on these. The pliers are spring loaded. It is not new with bit drivers on MTs. The Center Drive is when opened located at the center and makes it more comfortable using it because it is center located. There are several other functions inside the construction and one of them is a serrated blade with lock. This is very important for the safety and for rescue purposes. Having the serrated blade is a safety factor when you have to cut extreme materials, rope, webbing and similar. Having two blades is good if one should fail or break. Over the years I have learned some important details with MTs. One is that no matter how many functions you have in one pack it can be necessary having two separate tools. In some situation it is unavoidable that you must use both hands on a device or equipment. So far I have never seen any better MT than the Victorinox standard SwissTool with separate bits and key. The selection of functions together with "separate" mindset is unbeatable. The Gerber Center Drive is special because it is hard to believe that a MT could have some larger functions than the SwissTool and also having all the comfortable features with easy accessible main functions. The development of several innovations is in my opinion genius functions. The New Gerber flagship is very futuristic and I am surprised! It is difficult to say still if any yet is above the Victorinox designs. This is anyhow very interesting and it got my enthusiasm well up again with the MT world. I can really imagine this used in combination with separate tools and devices. Just the idea of having different tool-keys together with the CT can bring out much more functionality and safety depending on what philosophy you have. We live in a world with so many possibilities. The Center Drive got a serious knife blade with OH that opens up new possibilities when every second counts. The SwissTool is a top notch all-round MT that is difficult to compare to because of several factors. Both MTs got two blades and that is not by a random choice in my opinion. It is a well-schooled choice. The advantage with having larger functions is that they can be used for larger tasks and you save time. It is also a well-schooled choice having locking mechanisms because this is safer for the user. All my experience with SAKs and MTs is that professional tools must have locking mechanisms. That may sound weird for people that experienced users must have them. It is a fact that when every second count you do not always have time enough to do a secure cut releasing yourself or other people. It is a fact! 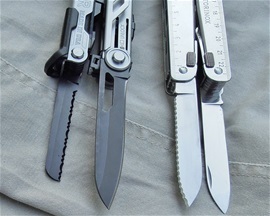 The main purpose with Multi-Tools is being a package of tools that can be helpful in the everyday life and work. Rescue and survival is not always a choice that people can determine before-hand because they got that tendency to happen when no one is prepared. 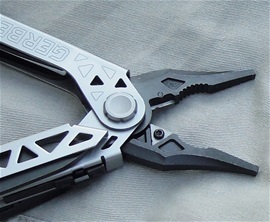 The pliers on the Gerber can be opened with one hand in a different motion that said. The SwissTool plier on the picture is an older design and the more modern is much more beefy. What I do like on the CT is the carbide inserts that can be rotated so have 3 surfaces on each insert. In usual terms you have at least 3 possibilities before replacement inserts are needed. Also on this you have a notch for cutting that you can find on the internet with information or you can check the packaging. Spring loaded pliers and the inserts are something I really like. The SwissTool pliers are some of the strongest in the MT world. The world is evolving with the need for several bit systems. The traditional flat and Phillips screws are not as common today as before. That is why the SwissTool in my opinion got the separate key and bits not only to be a separate possibility but also to be able to fulfill any systems used for equipment. It gives that huge freedom of custom making the bit selection you require personally. The Center Drive got a very nice possibility for bits. It opens up possibilities that only the imagination can limit. The slider for the locking mechanims on the internal functions got a design for the thumb to "rest at"during motion. Together with center location driver you have a sweet design. The notch on the Gerber Center Driver wire cutters inserts is there to cut or strip cable. Here it is a bit helpful that the pliers are spring loaded so you can determine the distance easier. The notches are designed narrow on one side and gradually wider. The clue with wire stripping is to cut the coatings without damaging the cords or wire. On the SwissTool the inner section is designed to cut harder wire than the outer section. I do not know if Gerber designed the notch to cut harder wire than the outer section. When I think about it is most likely that the inserts are equally hard all over. And you got the possibility to rotate if damage occurs. Let me know if you have any information. It is an advantage with a long cutting section like the Gerber got. Victorinox also adjusted the length on the designs. The inner section are usually the area you get the best momentum and cutting abilities. For us that have followed the MultiTool development know about many models. 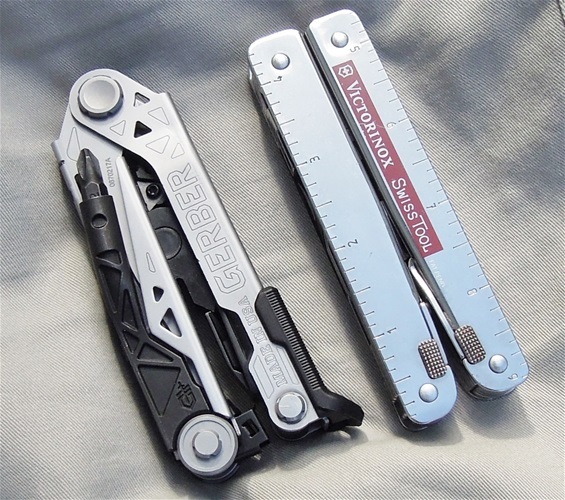 It is not new that Gerber use inserts for the wire cutter or cutting sections. Leatherman use it too. I believe it is a correct evolution step. It is important to have the bit for it if you are rotating it in the field or you can use a small key placed in a secure place because you will need a separate tool Spring loaded pliers are not new either. It is a very comfortable factor. That said I use the SwissTool without spring loaded design and it is very comfortable because I have used it much. With MTs you also always get the discussion on needle nose and blunt nose plier designs. Some are hybrids. In my experience it is the best with some width and gripping surface with both length and width. It gives a sturdier gripping when holding or releasing a fish hook for example. It all depends on practice and preferences. Needle nose designs can reach smaller places and in some situations easier to feel what you are gripping. From experience it is possible to use the wire cutters many times before damage could occur. This depends on use. It is important not to cut wire that’s too tough. It can happen if you cut too thick or tough wire that you damage the cutting sections. This may lead to problems opening and closing the pliers for correct motion. It may snag or get stuck. Then it may be necessary to use a dremel or a file to remove displaced metal. With rotating the inserts you can secure full correct motion and function again. I have experienced barbed-wire and what it feels like to get stuck. I used one time a Leatherman PST1 cutting several barbed-wire. It took it well and only got some dents. If cutting barbed wire I recommend using pliers that can rotate or replace the cutting section. I also believe I have seen one guy on the internet using inserts of other materials than carbide. I have seen some military used SwissTools in black oxide that’s been used a lot. It can really take it very well without inserts. I love to study MTs that’s where pretty much all the functions have been used. I really understand why the Victorinox SwissTools are famous across the world. For those that follow Gerber know about military used models that also have shown their quality very well. The inserts in the Leatherman pliers are made of premium stainless steel like 154CM. At least that is the information I have. 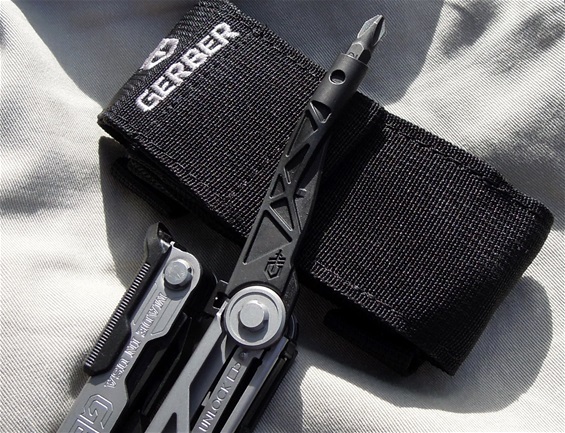 This i have on my OHT with a different design than the Gerber. They are replaceable never the less. On the internet I found someplace before discussions on making inserts of tougher material as well. Please do not hesitate to send info or ask questions about anything. Or if you have corrections. Advantages with carbide without knowing exactly what it is, is that it is usually very hard in HRC. The problem with wire cutting when the wire is harder than the cutting section is damage. This can be altered with special designs and how the steel is processed. I suspect the carbide to be harder than steel used in hard wire. I do not have knowledge with carbide on toughness vs hardness. I do suspect they have made sure it is above hard wire. Let me know because i am all ears. thats it for today.